It turns out Apple doesn’t need any product launches to help drive record financial results. On Tuesday, the company unveiled its financial results for the fiscal second quarter, setting record totals for revenue and profit for a non-holiday quarter. “The strong momentum we experienced in the holiday quarter continued in the March quarter,” Apple chief financial officer Peter Oppenheimer told analysts during a Tuesday conference call to discuss the company’s figures. The company reported earnings per share of $3.33, up 86 percent from last year’s adjusted total of $1.79. Analysts were expecting Apple to earn $2.45 a share, according to Thomson Reuters. “We are thrilled with the record March quarter results and the momentum of our business,” Oppenheimer said. Apple’s strong revenue and profit came during a three-month period in which the company had no major product releases. The company’s high-profile iPad launch happened a week after its fiscal second quarter ended, while last week’s MacBook Pro overhaul was the first change to Apple’s Mac lineup since the company introduced new iMacs, a unibody MacBook, and updated Mac minis last fall. Nevertheless, Apple executives credited strong Mac sales—the best figures ever for the usually quiet March quarter, in fact—and record iPhone sales for the company’s stellar showing. “Our very strong performance was due primarily to more than doubling in iPhone sales and strong momentum of Mac products,” Oppenheimer said. Apple sold 2.94 million Macs during the second quarter—a 33 percent increase from the same period last year. This quarter’s higher Mac sales were particularly noteworthy, as sales of Macs had actually dipped in the year-ago quarter. Sales jumped for both desktops and laptops in 2010. For the quarter, Apple sold a little more than 1.14 million desktops, an increase of 40 percent from last year’s quarter. Laptop sales rose 28 percent to just under 1.8 million units. 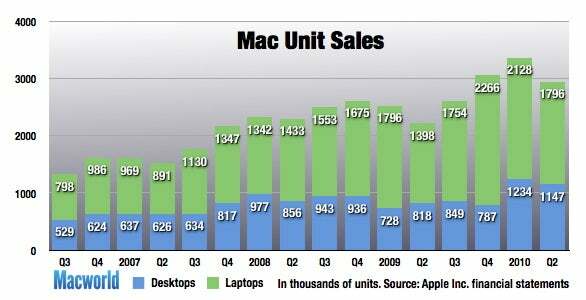 Oppenheimer noted that the 33-percent growth in Mac unit sales outpaced the overall growth of the market. Research firm IDC has the personal computer market growing at 24 percent, according to Oppenheimer. If Apple executives were pleased with the Mac’s performance during the second quarter, they were downright giddy about how many iPhones the company sold. Apple says it sold 8.75 million iPhones, an improvement of 131 percent over last year. Oppenheimer noted that growth rate was more than three times the growth of the overall smartphone market projected by IDC. 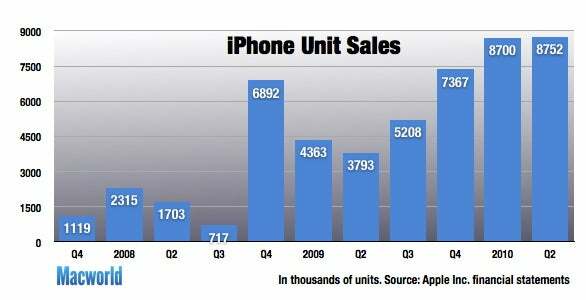 Executives credited the continued expansion of the iPhone for the phone’s strong growth rate. All told, the iPhone is now available from 151 carriers in 88 countries. Apple signed up new carriers and countries during the quarter, said Oppenheimer, citing the addition of Vodafone as a service provider in the UK and Ireland as one of eight carriers added in key countries around the globe. But the company also saw strong performances from its existing carrier partners, chief operating officer Tim Cook told analysts. When an analyst asked Cook if Apple would consider making the iPhone available to any carrier in any country rather than continuing exclusive deals with carriers, Cook’s response suggested that Apple was carefully measuring both of those options while not making any dramatic leaps. Cook also cited “staggering” growth rates for the iPhone in market around the world. Asia-Pacific saw a 470-percent growth rate, while units grew 183 percent and 133 percent in Japan and Europe, respectively. The picture wasn’t so robust for the iPod. Apple sold 10.89 million music players during the quarter, a 1 percent dip from the 11.01 million it sold a year ago. Nevertheless, the higher-end iPod touch continues to be a source of strength for Apple’s music-player business. 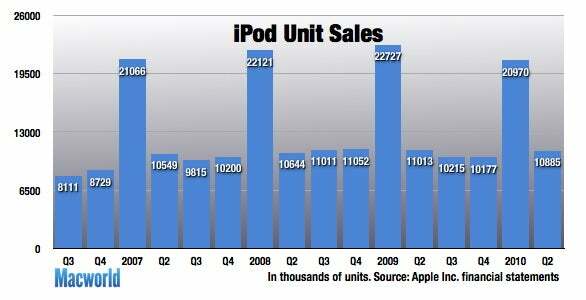 The company says it sold 63 percent more iPod touches than it did during the same period last year. 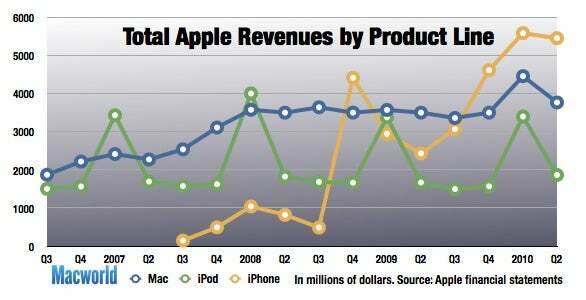 That helped revenue from the iPod business climb 12 percent to $1.86 million despite the otherwise flat overall unit sales. Things were decidedly more robust with the iTunes Store, which brought in $1.1 billion in revenue for the quarter. That marked the strongest quarter ever for Apple’s online multimedia and application retail arm, according to Oppenheimer. In February, the company passed the 10 billion download mark for music, while App Store customers have downloaded 4 billion applications for their iPhones and iPod touches. The App Store now boasts more than 185,000 applications, Oppenheimer said, with 3,500 of those optimized to run on the newly shipping iPad. Because the iPad didn’t hit retail shelves until April 3, it wasn’t included in the second-quarter numbers. However, Apple’s latest mobile device was a constant presence during Tuesday’s earnings announcement. When analysts weren’t asking questions about the iPad, Apple executives were talking about demand for the new product. “It has shocked us, the level of demand,” Cook told analysts. Apple says that it sold 500,000 iPads during the first week of the device’s availability. The tablet has proven so popular in the U.S. that Apple pushed back the international launch until the end of May. Earlier Tuesday, Apple announced that 3G-enabled iPads would arrive in the U.S. on April 30. On the retail front, revenues from Apple’s stores rose 22 percent from the year-ago quarter to $1.68 billion. Apple sold 606,000 Macs through its stores, up 38 percent from last year. Apple ended the quarter with 286 retail stores, including new ones in the UK and Germany. That’s consistent with Apple’s goal of half its new store openings in 2010 taking place outside the U.S. The company is planning on having 25 stores open in China by the end of 2011. Apple has $41.7 billion in cash and short- and long-term securities. That compares to $39.8 billion at the end of the December quarter. 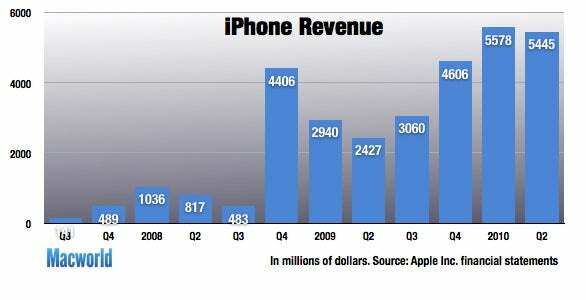 For the current third quarter, Apple has told analysts to expect sales to range between $13 billion and $13.4 billion. The company expects to earn between $2.28 and $2.39 a share. That compares to consensus analyst estimates of $12.97 billion in sales and earnings of $2.70 a share. 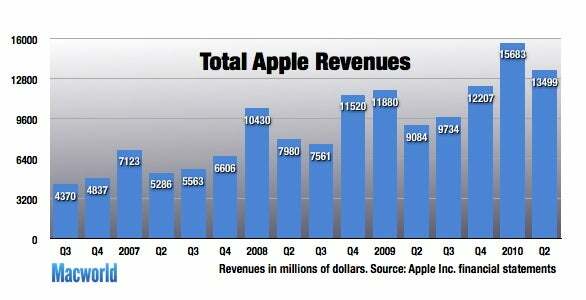 In the third quarter of 2009, Apple reported adjusted $9.7 billion and earnings per share of $2.01. “We are very confident in our new product pipeline and are excited about the months ahead,” Oppenheimer said. Updated at 1:56 p.m. PT to include Apple’s guidance for the fiscal third quarter. Updated at 2:58 p.m. PT to include more information from Apple’s analyst call, including Mac sales figures. Updated at 3:22 p.m. PT to include more details about iPhone and iPod touch figures. Updated at 3:40 p.m. with more details on Apple’s retail figures and the iPad.